We’ll want to get the highest price we can get for our house and the return on investment 100% if we’ve heavily invested upgrading the house. Well, that is fine. However, the house will be sold based on what buyer is willing to pay and how much the appraisal we’ll get for the property. This is where seller motivation comes into the picture. The overpriced houses stay on the market longer or may not sell at the listing price. One of the biggest reason is, the over price listing often doesn’t come into their search criteria, therefore they even don’t know your property is for sale. I coach the seller how to get maximum value for your house. The older properties need a lot of cosmetics up keep compared to new properties. This is the best time to repair anything broken or major repair work otherwise you may end up paying more after buyer does the inspection. landscaped patio, all wood floor, volume ceiling, Cut-de- sac location are all desirable for a lot of buyer’s if not all. These factors will impact when determining the listing price of the house. We make our buying decisions with emotions, heart, and justify with the mind. The positive vibes about the house how good it will start from outside. The buyer will make the positive impression of the house if it looks appealing from outside. The new construction sale is dependent on how well they have staged the models. The color and decor alone create excitement for the buyers. The same is applicable for re-sale especially if the house is vacant. The staged house will not only sell fast it will bring top dollars in most cases. All in all the house should look as specious as possible. Rent a storage to store all extra items you enjoyed having around, the easiest way to make your house look bigger is to keep bare essential in the house for selling. Now that house is prepared by taking care of the items we discussed above in pre-listing. Here are the few important steps REALTOR will help you navigate through. The world needs to know your house is for sale and it is in the market. My YouTube video channel and the social media communication channel are front and center in the marketing campaign. Good planning and preparation are a prelude to a successful closing. I recommend my clients to have a pre-sale home inspection to avoid any surprises later. If there any major structural, leaks, pests, or roof issue are there you as a seller needs to know beforehand. If you’ve made the upgrade to your house, it will be a good idea to have all the permits, major repair or remodeling paperwork made available to the buyer. Flexibility is key here for the sellers, yes at times it will be an inconvenience but required to sell the house for top dollars. The formula is very simple; the longer the property stays on the market, the less likelihood you’ll get the top dollars. Therefore, seller’s need to be flexible to show the property at a moment’s notice. Making the seller understand the upgrade they do in the house is for their enjoyment and lifestyle. The expectations that buyer will pay 100% for the bar you added or Jacuzzi you installed may not be buyer’s choice. Therefore, you may not get a return on your investment. It is REALTOR’s job to bring both parties to a happy medium. I like to set the exceptions with the seller what is their must have price during the pre-listing. This helps the seller to calculate their net return after closing ahead of time. There are three major contingencies from day one to day 21. The inspection contingency, appraisal contingency, and loan contingency. The REALTOR will help you be on top of these contingencies. The contingencies removal at given time is important to keep the buyer engaged and close on time. Curious about how I’ll sell your property. 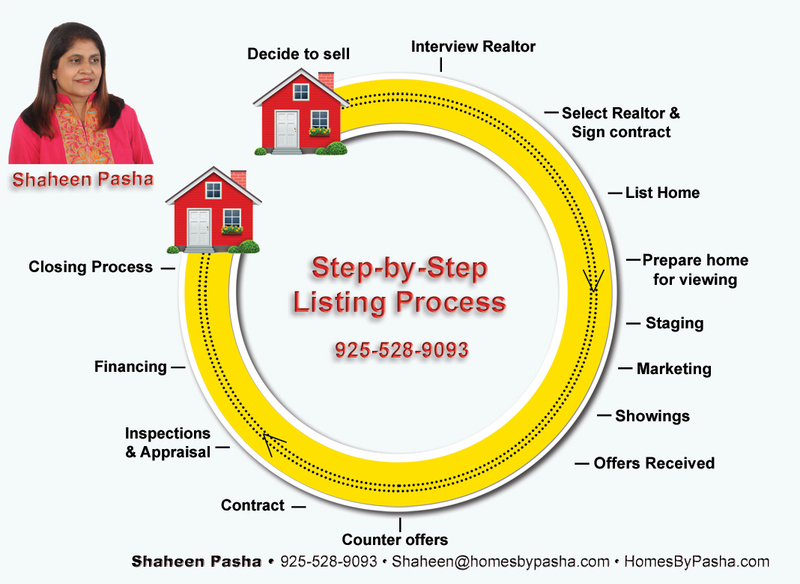 Please contact me at 925-528-9093 or shaheen@homesbypasha.com ; I’ll be happy to go over in details for you to make final decision. I work in the capacity of real estate advisor and subject matter expert than a sales person as making the sale is not my objective rather consulting with seller to make the right decision. I cover the following areas in East bay: Dublin, Pleasanton, San Ramon, Danville, Livermore and Mountain House.